I finally got some decent pictures of MoneyPennies and Fisher. This is MoneyPennies, my 8 year old DEW male Ferret. My sister rescued him from a neglectful owner about 5 years ago. He is the most laid back Ferret you could ever meet. 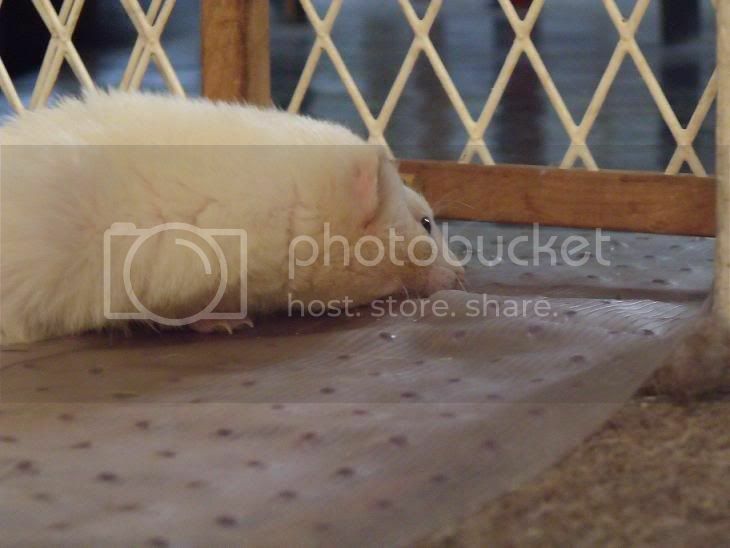 This is Fisher, my 7 year old light sable male Ferret. I adopted him from a Ferret rescue about 3 years ago. The rescue owner told me that he was found loose trying to get into someone's house. The homeowners were afraid of him and trapped him under as bucket wrapped in a fishing net for two days until they finally chose to give him to the Ferret rescue. He has lost some coat color over the years but is still as playful as ever. Him and MoneyPennies are best friends. Oh, and more about MoneyPennies' pervious owner. She was a friend of my sisters who we had not seen for a few years. 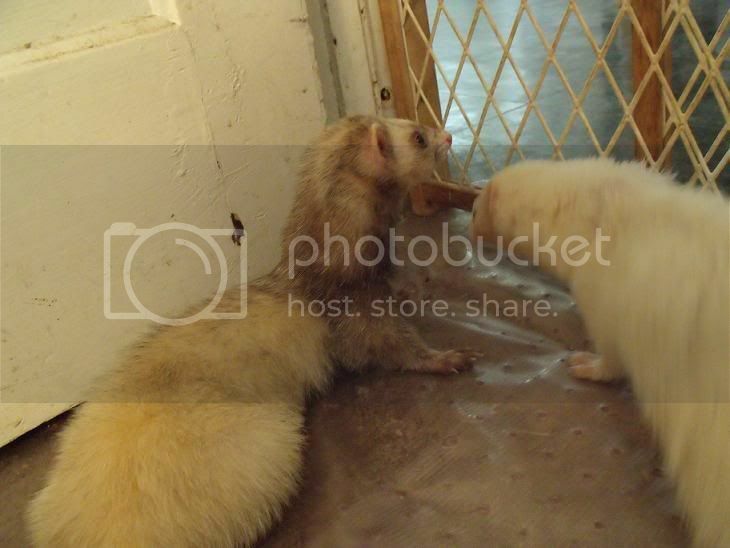 When we went to go vist her we found her 4 ferrets in a small cage outside in the middle of winter. The lower half of the cage was completely covered in poop and one of the ferrets had a huge poop covered sore that had maggots in it (she died shortly after unfortunatly). They had been feeding them cheap cat food which was given to them just by ripping the bag open and pouring it out over the top of the cage. My sister managed to talk the owner's mom into forcing her to give us MoneyPennies (then named Silverado). She then gave the other two ferrets to her older sister (who did not live with them). Unfortunatly we tried and tried to get the other two ferrets but she would not give them up. One day we found out that her sister had not wanted them anymore and let them loose outside of her house in the woods. One ferret was killed by a bird of prey and the other was found hiding in a shed. Well she gave the remaining one back to her sister (the original owner) who kept him in a kitten-sized pet taxi and never let him out. At least we saved MoneyPennies I guess. I just wish I could have taken them all. I am glad we rescued him too. He is an awesome ferret.